Toronto, April 2: It has been twenty-two years since JK Rowling released Harry Potter and the Philosopher’s Stone, the first book of the Harry Potter series which brought alive a whole new world of magic and wizardry for children across the world. The books have found immense commercial success and subsequently seen their adaptation into a multi-million dollar film franchise. But for some Catholic priests in Poland, the Harry Potter books are sacrilegious as they represent the world of ‘sorcery’. 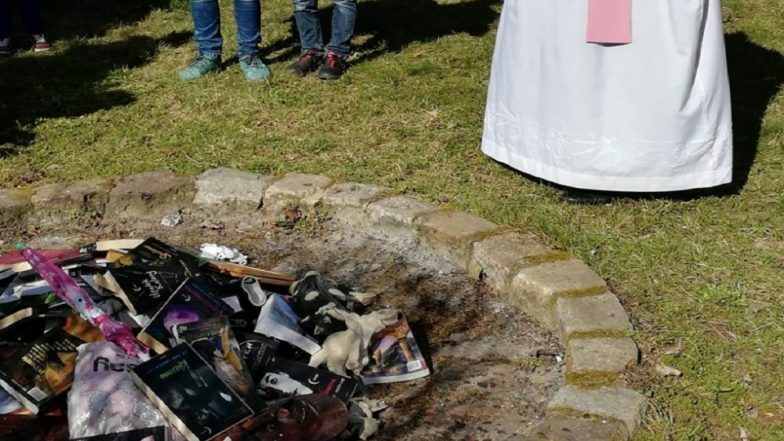 The priests in Northern Poland hence held a book burning ceremony in the city of Gdansk to renounce and condemn the concept of magic. An evangelical group, the SMS from Heaven Foundation, posted pictures of the book burning ceremony on their Facebook account. A Catholic priest and choir boys are seen around a pile of burning books. The pile also contains a figurine of an elephant and a face mask. The Facebook post justifies the burning of the books with Bible quotes of “We obey the Word”. The group quotes verses from the Old Testament to decry the use of magic and says they are following the teachings of the Bible when they do so. A passage from Acts, quoted in the group's post, says "many of those who had practiced magic collected their books and burned them in front of everyone. So they calculated their value and found it to be fifty thousand pieces of silver". Read: Meet Remus, a Dog Which Responds to Harry Potter Spells! Poland has a sizeable Christian population which follows the Roman Catholic church. The country also has a conservative Law and Justice (PiS) party in power which espouses traditional Catholic values.